Accessible trains and (accessible) infrastructure need to be completed by boarding assistance systems (BAS), allowing bridging of the vertical and lateral gap between platform and the vehicle floor. These systems, primarily meant for wheel chair users, shall also be helpful for other people with walking difficulties. This is especially important, bearing in mind the growing population of elderly people in our ageing society. 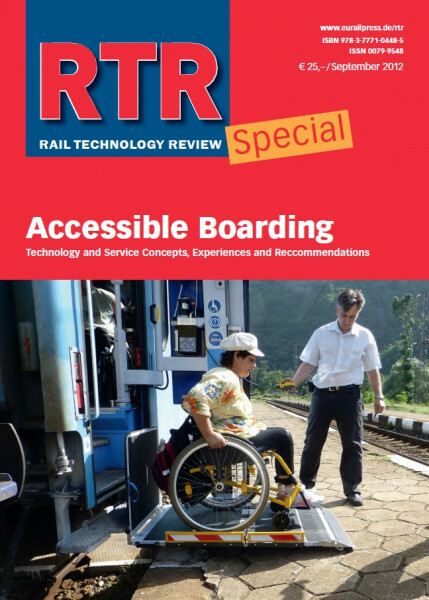 The results of the European FP 7 project “Public Transportation Accessibility for All”, presented as a part of this special issue, deal with recommendations for improvement of BAS and introduce a new prototype of a vehicle based lift for classic high floor coaches developed in the project. A quarter century after the first edition of the UIC leaflet 565-3, it now is a good opportunity to review the state of the art in the accessibility of public rail transportation systems, the variety of actual accessibility solutions and practices, as well as the possibilities for further improvements in this field in a special issue of RTR.